The casement window opens inwards or outwards with the help of a sash that is fixed on outer frame. The design can vary from fixed, side hung or top hung. Windows offers this design based on size, windload, insulation and design requirements. Casement windows are characterized by sashes that swivel into open/closed positions as opposed to the sliding motion of single-pane and double-pane windows. They differ from awning windows only in that they open horizontally while awning windows pivot vertically. Casement windows are side-mounted using either hinges on one side or hardware above and below the sash to allow them to swing outward horizontally. Crank hardware is attached that allowed the window to be opened and closed via rotation of a handle. Casement windows are designed to be airtight, and can be used in a wide variety of settings. 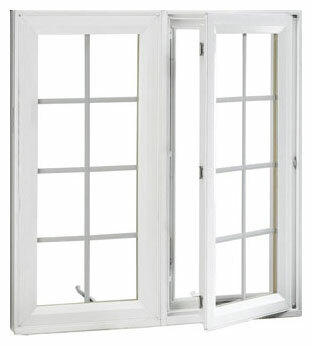 Fixed window is the simplest casement window. It does not have any open able sash and hence no hardware. Single piece of glass is fitted in the UPVC frame if requested.